Signed on April 10, 1998, the landmark Good Friday Agreement helped to bring to an end the 30 years of sectarian conflict in Northern Ireland known as the Troubles. Twenty years on, Deaglán de Bréadún looks at how the agreement came about, the American role, and the current state of play. In the early 1990s, the blood-soaked contest between the Irish Republican Army (I.R.A.) and the British security forces in Northern Ireland had reached a stalemate and the movers and shakers in both camps were looking for a more constructive way forward. But if the militants of the I.R.A. were to be persuaded to adopt non-violent means, they had to be shown that people like Gerry Adams, leader of the movement’s political wing, Sinn Féin, could get a platform that would eventually yield results. A key moment in that regard came about when President Bill Clinton was persuaded by leading Irish Americans such as former Congressman Bruce Morrison, businessman Bill Flynn, journalist and publisher Niall O’Dowd, philanthropist Charles “Chuck” Feeney, U.S. 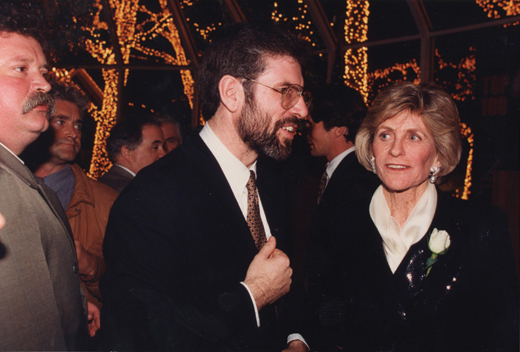 Ambassador to Ireland Jean Kennedy Smith, and her brother, the late Senator Edward Kennedy, to grant a visa to Adams, who had been banned from entering the U.S. because he was seen as an apologist for terrorism. 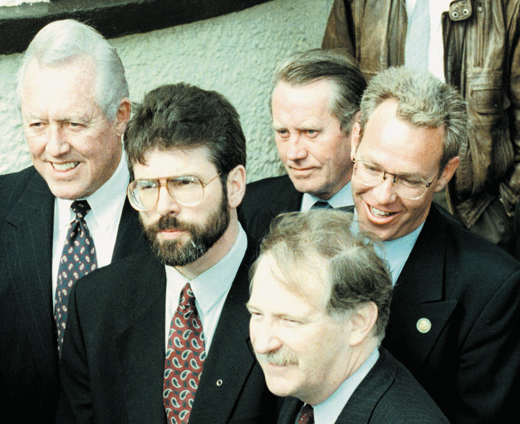 It was January 31, 1994, when the Sinn Féin leader arrived in New York on a 48-hour visa. Irish America turned out in large numbers for the visit, which became a major international news story. Exactly seven months later, on August 31, the I.R.A. announced it was going on ceasefire from midnight. The ceasefire collapsed on February 9, 1996, when a truckload of explosives was detonated in the London docklands, killing two people and injuring 40. The guns fell silent again on July 20, 1997, but it was clear that a serious settlement would have to be reached to ensure that it would last this time around. Efforts to broker a peace agreement continued and finally came to a head in the week before Easter Sunday 1998. Most of the main parties in Northern Ireland were at Castle Buildings in Stormont, on the eastern fringe of Belfast, with former Senate majority leader George Mitchell as the principal chairman of the talks. British Prime Minister Tony Blair flew into Belfast at short notice to help resolve the differences and, having declared it was not a day for talking in soundbites, went on to do exactly that when he said, “I feel the hand of history on our shoulder.” His Irish counterpart Bertie Ahern suffered a personal tragedy when his mother, Julia, died suddenly of a heart attack in Dublin, but the Taoiseach still managed to combine the funeral ceremonies with attendance at Castle Buildings, flying up and down as the situation required. The government in Dublin was prepared to modify the territorial claim to Northern Ireland in the Irish Constitution but was seeking a wide-range of North-South institutions to minimize the political damage among its own supporters. When Ahern agreed to cut back the number of cross-border bodies and areas of cooperation, the mood on the unionist side improved: the list went down to 12 from more than 60. There was agreement on an elected Northern Ireland Assembly with a cabinet-style Executive where powers would be shared on a mandatory coalition basis between representatives of the unionist and nationalist communities. In a meeting at 3 a.m. on Friday April 10, Gerry Adams and his republican soulmate, the late Martin McGuinness, were promised by Blair and Ahern that all politically-motivated prisoners would be released within two years. There was a last-minute crisis in the Ulster Unionist Party (U.U.P.) delegation over the decommissioning of I.R.A. weapons because elements in the U.U.P. felt the conditions were not sufficiently strict. However, a letter of reassurance from Blair allowed U.U.P. leader David Trimble to accept the final deal. Blair and Ahern were assisted by a huge effort from President Clinton who was in contact by phone with leading participants throughout the last night of the protracted negotiations. The first power-sharing Executive took office the following year, led by the U.U.P. and the moderate nationalists of the Social Democratic and Labour Party (S.D.L.P.) but also including two ministers each from Sinn Féin and the Democratic Unionist Party (D.U.P. ), even though the latter had walked out of the Stormont talks. Sadly, both men have since died. The Executive they established lasted a remarkable 10 years until January 2017, when a major dispute erupted over state payments into a highly expensive renewable energy scheme which was meant to be under the supervision of a government department headed by the current D.U.P. leader Arlene Foster. McGuinness, who was in the final stages of a fatal illness, called on her to step aside temporarily as first minister while an independent inquiry took place into the operation of the so-called “cash-for-ash” scheme. When she refused, Sinn Féin walked out of the Executive and the Assembly, both of which have been in suspension ever since. Despite protracted talks between the D.U.P. and Sinn Féin, no agreement has been reached at time of writing on a resumption of the political institutions. The key point of difference is on Sinn Féin’s demand for legislation to enhance the status of the Irish language, which has become a major symbol of political respect for nationalists and republicans. It is understood that senior D.U.P. figures are well-disposed to an agreement but have so far failed to overcome the opposition from hardliners in the party. Meanwhile, demographic changes indicate that the Catholic, mainly nationalist, element of the population will become the majority community in Northern Ireland in less than 20 years. The last census in 2011 revealed that, in the under-five age-group, 48 percent were Catholic and 37 percent Protestant. Based on these figures, Irish Times economic commentator David McWilliams has calculated that Catholics will achieve an absolute majority in the North by around 2036. More recently, leading academic Dr. Paul Nolan told the BBC that Catholics could outnumber Protestants in Northern Ireland within three years, by 2021, although he pointed out that being a Catholic does not necessarily mean you want to see a united Ireland. At a political level, in the last elections to the Northern Ireland Assembly, the total of 28 seats won by the D.U.P. was only one ahead of Sinn Féin at 27 seats. The difference in the number of votes was also very slight: the D.U.P. got 225,413 compared to 224,245 for Sinn Féin – a gap of only just over a thousand. The tectonic plates are shifting. Under the terms of the Good Friday Agreement, a united Ireland will come about if separate majorities in the two parts of the island vote for it. Brexit, the looming departure of the United Kingdom of Great Britain and Northern Ireland from the European Union, has revived interest in the topic of Irish unity. Opinion polls indicate for the most part that, while there is a very clear majority in the North at present who wish to remain in the U.K., this figure would be reduced if there was a “hard Brexit” that had seriously negative economic consequences. Meanwhile, in the South, polls generally show a substantial majority for unity, but this would go down significantly if it meant paying extra taxes. Following the Brexit vote, there has been a sharp rise in applications for Irish passports from citizens of Ireland living in the North and Britain. The Department of Foreign Affairs and Trade in Dublin said one in every five passport applicants came into this category last year. A total of 779,000 Irish passports were issued in 2017, the highest ever in a single year. There were 6,300 applications to the department’s mission in New York. Despite the impasse at a political level, work continues in the North-South bodies and the areas for cross-border cooperation that are part of the Good Friday legacy. Tourism Ireland, for example, was set up following the agreement with a remit to promote the entire island, North and South, as a destination for holidaymakers and businesspeople. With a staff of about 150, it has created marketing programs on a wide international basis as well as at home. Remarkably, considering its recent history, Belfast has become a very popular tourist destination with such attractions as the Titanic center, which recalls the ocean-liner’s ill-fated voyage of 1912, and tours from the city to locations used in the filming of the hugely-popular Game of Thrones television series. Areas of cooperation also include agriculture, education, environment, health and transport. There are north-south bodies dealing with waterways, food safety, trade and business, special European Union programs, aquaculture and marine issues, the Irish language, and the dialect of Ulster Scots. Deaglán de Bréadún is a columnist with the Irish News and former Northern editor of the Irish Times. His books include The Far Side of Revenge: Making Peace in Northern Ireland (Collins Press, 2008) and Power Play: The Rise of Modern Sinn Féin (Merrion Press, 2015). The first paragraph of this very interesting and informative article describes the recent Troubles in the northeast corner of Ireland as “the 30 years of sectarian conflict, which is largely but not entirely accurate. From the beginning of the Troubles, some Protestants player a major role on the Nationalist side. Ivan Cooper, a Protestant, was the leader of the Civil Rights in Derry on Bloody Sunday, when British soldiers shot dead 12 Nationalists marcher. In the fall of 1982, Ivan Bell succeeded Martin McGuiness as Chief-of-Staff of the Provisional I.R.A. and this Protestant was one of the most militant and uncompromising of the Nationalist leaders. Other Protestants were also leaders on the Nationalist side. While I was reading the above article, new C.I.A. leader Gina Haspel was being grilled in the Senate about her apparent approval of waterboarding shortly after 9/11/200i, an action of which not all Republicans did not approve. Nine years before 9/11, LIAM HOLDEN was the victim of torture that included waterboarding by soldiers of the British Army in Belfast, which forced the teenager to confess to a murder he had NOT committed. His death sentence was commuted to life in prison. Liam Holden would not be reassessed from prison until 1989, having 17 years for acrime he did Not commit. This is completely true !!! The British soldier that Holden was accused of killing was Private Frank Bell, who was said to be 100 of his army to lose his life in the North of Ireland that year. In 1898, the European Commission on Human Rights decided that LIAM HOLDEN’S treatment was “cruel, unusual and degrading”, but Holden would remain in prison for another 11 years. The mainstream media at either side of the Atlantic scarcely even mention the waterboarding and torture of Liam HOLDEN. One wonders how many more were wrongfully convicted by the British authorities in the corner of Ireland they still occupy. A recent poll shows that less that half the residents of the Six Counties consider themselves British. When we discuss the Good Friday Agreement, we are reminded of how Padraig Pearse’s words at the funeral of O’Donovan Rossa, “Ireland unfree shall never be at peace”. Since Pearse made that comment over a century ago, he has been proven right continuously.